You are here: Home » Antichrist » Prophetic dream reveals Obama shackled and wanting to be released. 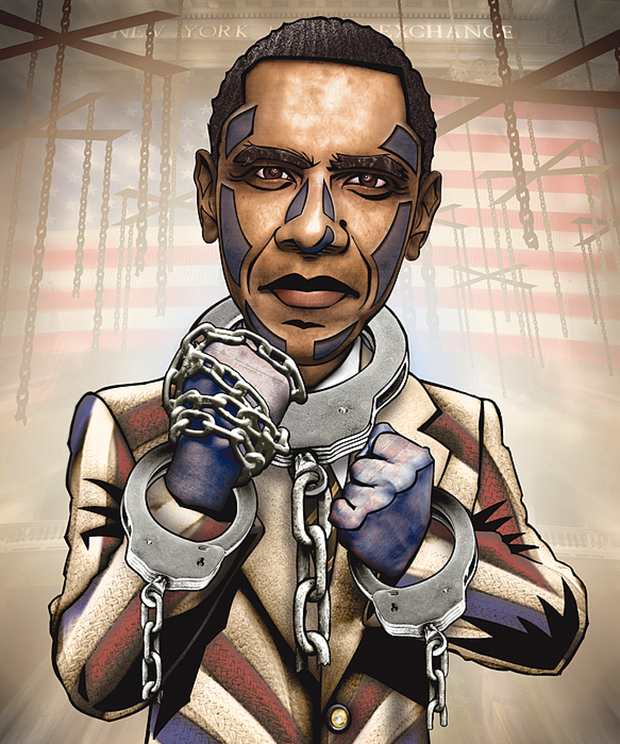 Prophetic dream reveals Obama shackled and wanting to be released. Z3er Spike Jxn shared the following dream he received regarding Barack Obama. In the dream, I don’t know where I was, but there were other people around. I knew this, but I didn’t know who they were or if I even knew any of them. I didn’t see any of their faces as they were all on both sides of me as well as behind me. All my focus and attention was on Obama (he was still in office but in his final days) as he was standing on a stair directly in front of me. I didn’t want to get any closer to him, but felt myself moving toward him and it was like I couldn’t stop myself. As I got right in front of him, the evil permeating from him was so thick it was suffocating. Then he leaned down and while cupping his mouth with his left hand so nobody around could hear, he began whispering incoherent gibberish in my right ear. Then he firmly but gently began pushing down on my shoulder as I was bending down. I looked at his feet and saw his ankles were shackled together. Then I realized he was wanting me to remove the shackles for him because for some reason he was not able to do it on his own, even though his hands were completely free. I said, “No, I am not doing that”. Z3 News Contributor Lydia Hodge provided the following interpretation. I will share a dream I had because I think it relates to this and I will share what I believe could be the interpretation to your dream. I dreamed one night that I was telling my daughter we were living in the end times and things were going to begin to move very quickly, so she needed to prepare herself for what was coming. Then my attention turned to a very dark room. I opened the door to the room and inside, in the darkness, was a horrible beast chained to a bed. I knew the beast was being held there until a specific time and then he would be unleashed. I looked intently at the beast and recognized his face. It was Obama’s face. I believe your dream is very similar, revealing the beast is Obama, but he is shackled. He cannot enter his role until the appointed time. His speech is a significant part of his role because he will be given a mouth speaking great things and he will speak against the Most High. I think the shackles are connected with the things he will be speaking. When the shackles are removed, he will be given the mouth speaking great things. He sought your help in releasing his shackles, but you weren’t willing because you are part of the true Church. I believe the apostate church will play a part in releasing him into his end time beast role as he rises back to power among the apostate system of government, which will be dominated by the whore spoken of in Revelation 17. The false church will receive him as their messiah, their king and their priest. Spike Jxn replied with the following comments regarding Lydia’s interpretation. Thank you so much for your sharing your dream as well as the interpretation for mine. So it is true, Obama is “the” anti-christ? If I am understanding correctly. If so then this confirms others posting here at Z3 as well as other prophetic sites, and excitingly I am thrilled to be included in “old men will dream dreams” category! Hallelujah Yahshua Hamashiac! We certainly are coming down the home stretch. I believe Spike Jxn’s dream reveals the fulfillment of the Apostle Paul’s prophecy, as recorded in his letter to the Thessalonians, as shown below. The beast will be restrained until the one who restrains him is taken out of the way. Then his true identity will be revealed to the whole world, but by then it will be too late for multitudes who have already taken his mark and worshipped his image. Although the identity of the beast will not be revealed to the world until after the restrainer is removed, God is already revealing his identity to His righteous remnant so they can sound the alarm. Like so many other prophetic dreams, this one reveals Barack Obama is the one who will become possessed by the spirit of the beast. In the past few years, I have documented over 200 similar dreams and visions, all pointing to Obama as the one, which is interesting because I have yet to hear anyone receiving any prophetic dream or vision pointing to anyone else. I’m not someone who dreams a lot, neither are my dreams very clear (often fuzzy and in grey tones, seldom in color and broken up a lot / snippets here and there). But there was one really weird dream where I was in a big church, tiered like a cinema, with probably a rock-star preacher preaching. At the end of the service everyone was seated around round tables like ready for dinner, I happened to be at the table where seated opposite me was Obama, I kind of freaked out first time seeing him in person (in the dream), and hid my startled behavior towards him/it as I have learnt so much about his life of total and pure deceit over the years, yet he/it managed to come across as warm and sincere at that table. I felt almost ashamed to think that way of him/it and almost felt like he/it had a certain anointing that he/it was trying to “bless” me with. I woke up bewildered from the dream straight after. In reality, I cannot stand to see a photo of this entity and it troubles my heart every time I hear him/it speak (I will mute the sound, skip or lower the volume). I’m glad you placed a drawn cartoon of that guy instead of another photo James, thanks for that. I believe the undoing of this planet is through this entity. Thanks for sharing this dream OnginSG. I got a good laugh from all the “it” references. To understand the often enigmatic drops, go here: https://app.smartsheet.com/b/publish?EQBCT=6588bf56d814417bb759beca4fc52232 it will provide explanations and deeper meanings of intel. POTUS is being backed by military in this and is going after the global elite. Pray, Pray, Pray for the safety of all those involved and success in this endeavor. Back in early 2007, my online friend warned me about the then senator from IL as a presidential candidate. She lives in a state far from IL.The first time she saw his photo, “a knowing” was dropped into her heart that she was looking at the anti-C.
My question to you James, how does this square up the the Word that says he will be from Syria, a Syrian? Although we obviously know little about BS. Have you heard that BS is Syrian? When i first saw Obama running for election against Hillary Clinton i instantly felt repulsion and my whole self was put on alert against him and i wondered why as he seemed on the outside a good looking, well spoken and dressed man but i couldn’t get over this feeling of repulsion and that he must be hiding his true self and that his true self was Very Dark Indeed…! Indeed they are, Michelle. It’s getting more and more intense by the week, even by the day. We’re getting so close. I have had a feeling for several months now that something big will happen in March, something that will be a game-changer. I am not sure what exactly it is, but I’ve heard others mention March as well. Sister Abby for at least the last five years GOD has been telling me to watch the Ides of March , don’t know why , but I watch every year . Thanks for sharing this word John. Maybe it applies to this year. I believe they are being revealed now to our generation since we are the generation who will see the fulfillment of Daniel’s prophecies. Hello James. This is very informative. May God bless you and the Z3 Team. (by the way – I agree and think the George Washington prophecy is legimate). In the spring of 2014, when I first asked God about Obama, he revealed to me he is the one who would fulfill Daniel 11:39, taking action against the strongest of fortresses, which is the United States. Later that year, God confirmed it with a dream showing Obama leading a large organization intending to mass murder the American people. In the same dream, I heard a voice of someone standing behind me telling me Obama had completed his assignment here and was en route to his next assignment. In the dream, I understood I was seeing things years in the future. Since I was told, “He has completed his assignment,” I believe he will succeed in causing great harm to our nation, causing great loss of lives and money. Obama is not who he claims to be. He is more evil than anyone I have ever seen. He is a deceiver assisted by demonic spirits of deception and prospering in his lies, which is why his approval rating remains very high, even among many who claim to be Christians, but are in darkness. Given the lateness of the times we are living in, I think the war George Washington saw coming to our land must be the same one that comes as a result of Obama’s evil schemes. I don’t think there are enough years remaining for two major wars fought on American soil before the Lord returns, but I could be wrong about that. The good news is George Washington also saw a righteous remnant taking a bold stand and eventually succeeding in driving the foreign troops out of our land. I ran across this video by Minister Paul that addresses this speech in light of revelation he has received. The confirmations of truth just keep coming on the creature. I was shown a few years back that there is a restrainer holding the set snares back, but they are awaiting a ‘signal’. Then they will all be set off and ‘rise up’. Back in early 2007, my online friend warned me about the then senator from IL as a presidential candidate. She lives in a state far from IL and had never heard of him. The first time she saw his photo, “a knowing” was dropped into her heart that she was looking at the anti-C.
My question to you James, “How does this square up the Word that says he will be from Syria, a Syrian?” Although we obviously know little about BS. Have you ever heard that BS is Syrian?